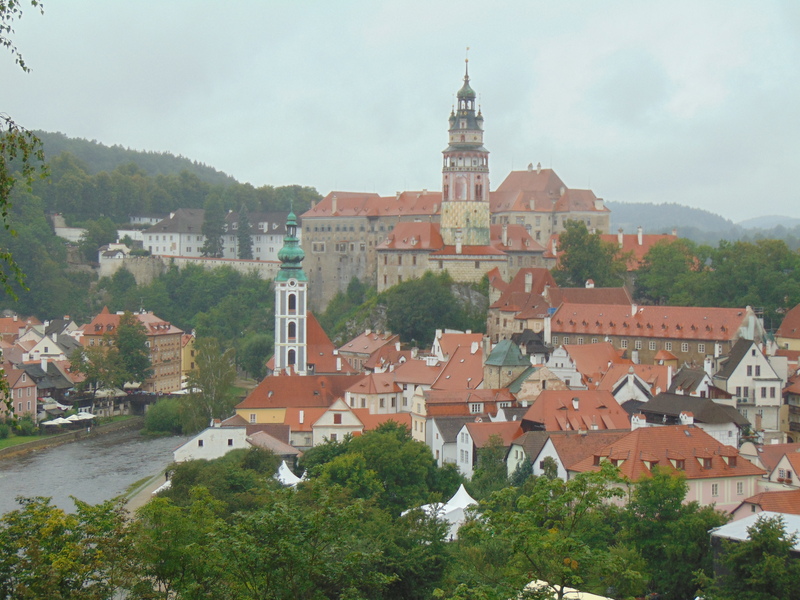 Cesky Krumlov is the second-most-visited place in the Czech Republic. 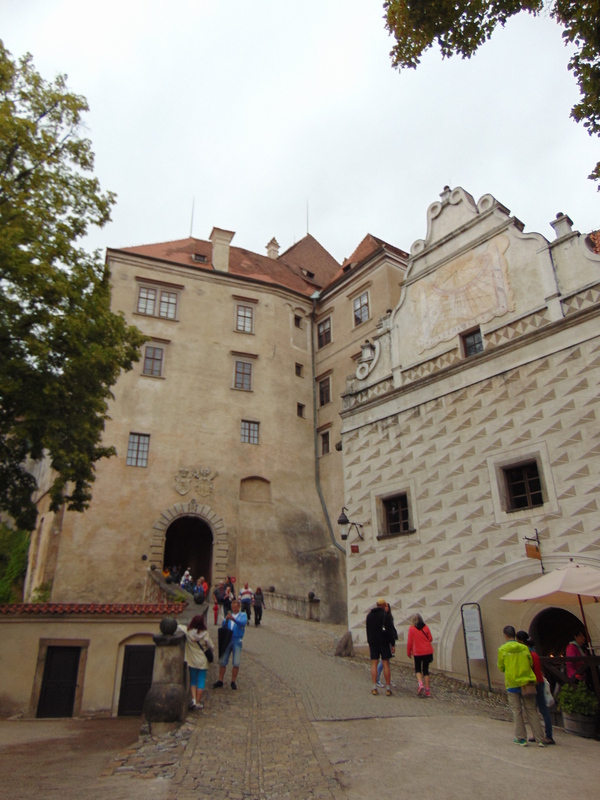 It’s also signifcantly tinier than the most visited place (Prague), which means that while you absolutely should see it, it will be crawling with tourists when you decide to do so – at least if you’re foolish enough to visit in August, like we did. But even when you can barely move without being whacked in the face by a selfie stick (or umbrella – we were not lucky with the weather), it’s definitely worth a visit. 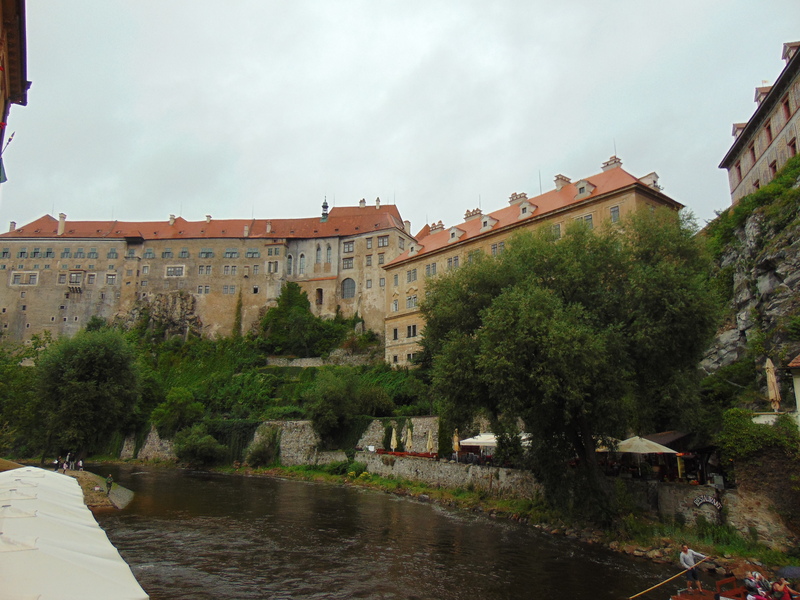 It’s doable in a day trip from Prague, with frequent coaches making the three hour journey, and you probably wouldn’t need to spend more than one night there, unless you were planning some hikes in the surrounding hills. 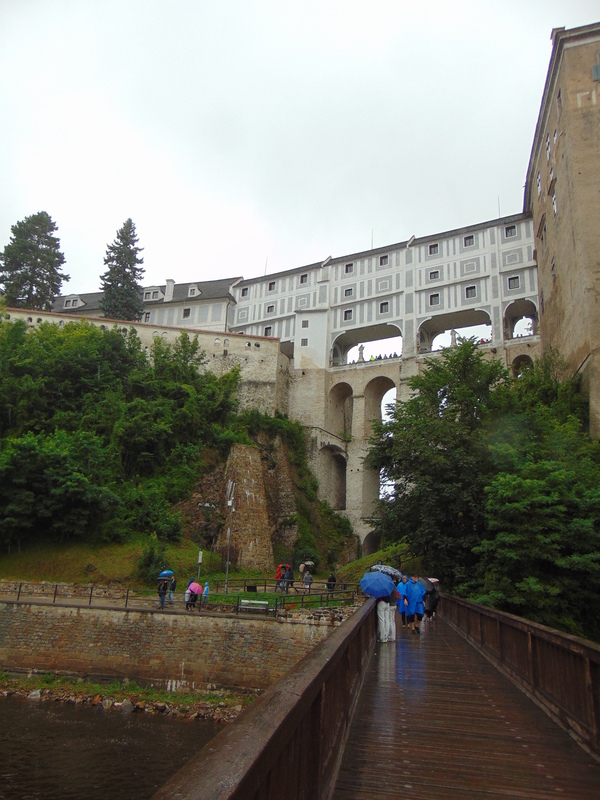 The entire town is charming and looks like it’s from a fairytale, but the castle is the real highlight and it’s impossible to miss. 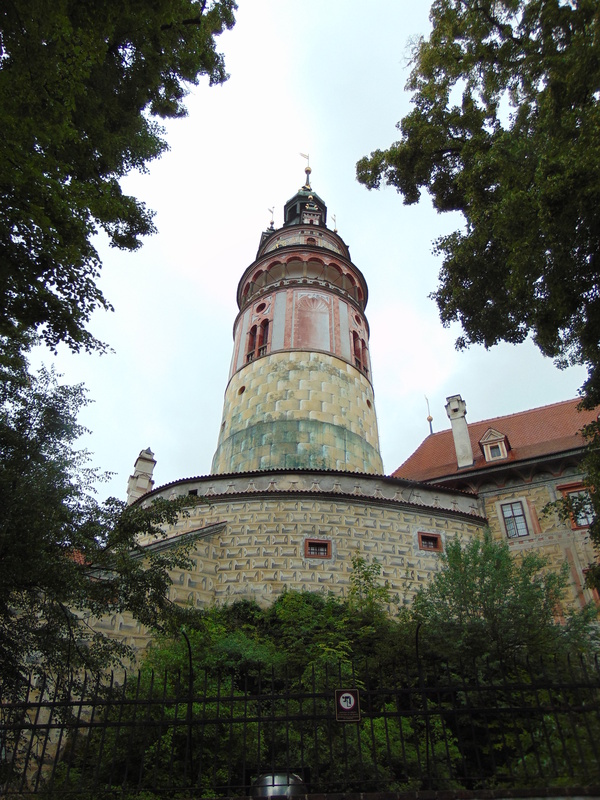 The famous tower is in the first courtyard and you can get pretty close without paying to enter it. Truthfully, I’m not the biggest fan of this style of painted on stones, but it is authentic and it looks colourful, so why not? And here is the castle proper! This entrance takes you up and into a series of beautifully-decorated courtyards. Finally you emerge onto this grey bridge up top and some viewpoints which are very impressive. 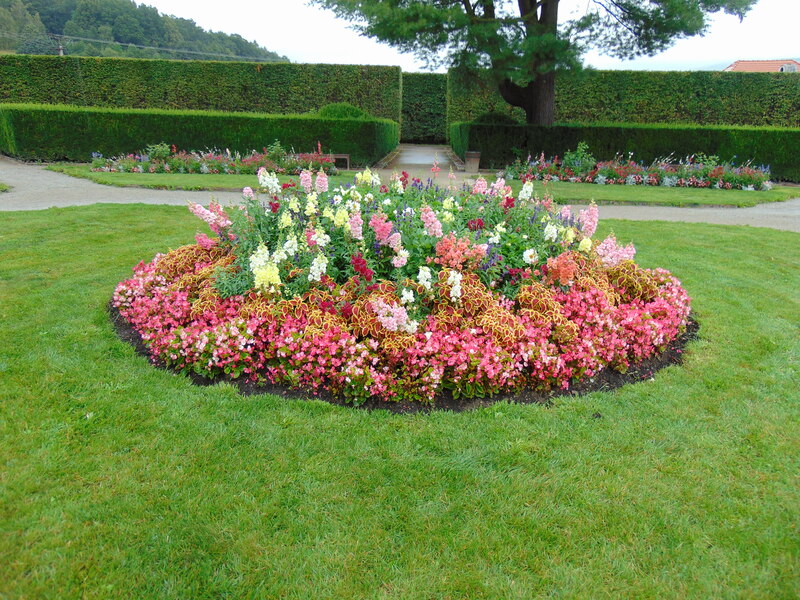 And the castle has some nice gardens too, even if they were somewhat sodden when we visited. You can pay to enter the castle, I believe, but we were happy saving our pennies and exploring all of this for free. 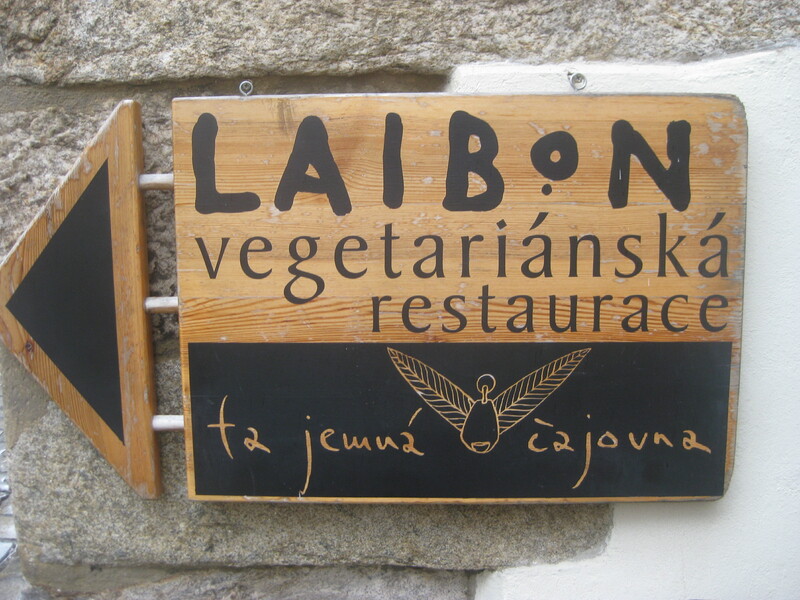 Cesky Krumlov is so small it only has one meat-free restaurant: Laibon. Fortunately, it’s a good one, with lots of vegan options and a perfect location by the river. There’s a lot of outdoor seating to make the most of that, but we took shelter from the rain in the dark and cavernous indoor part. Vegan and veganisable options are marked on the menu, and there are quite a lot to choose from. I finally settled on the laibur, which I presumed the restaurant was named after, so it must be good! It was. 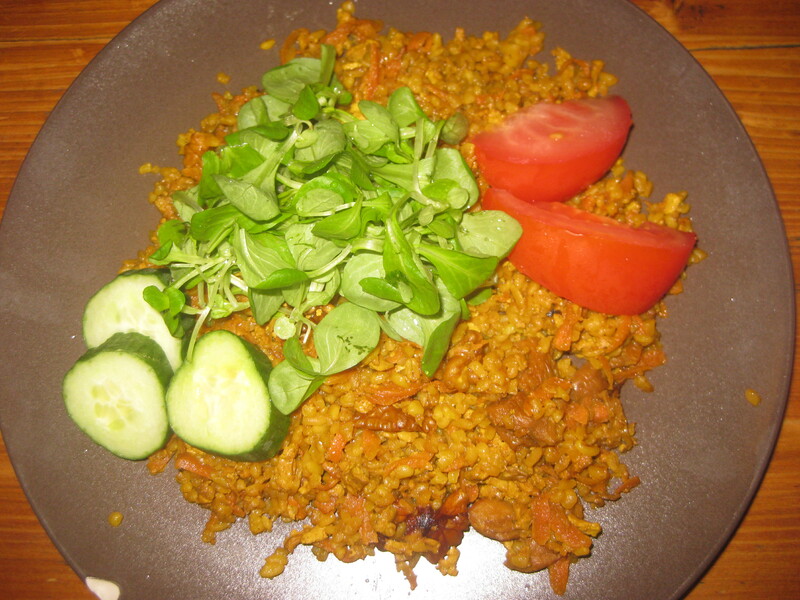 It consisted of bulgur wheat, carrot, walnuts and smoked tofu, and it made a really filling and flavoursome dish. I’ve never really had anything like it before. There are enough options on the menu to allow you to come back here again if you’re staying a few days – other than this, there were a couple of veg-friendly places listed on Happy Cow, but not a lot else. And I know I’m only supposed to recommend one place to eat in each post, but let me sneak in a second, because you know you need dessert. 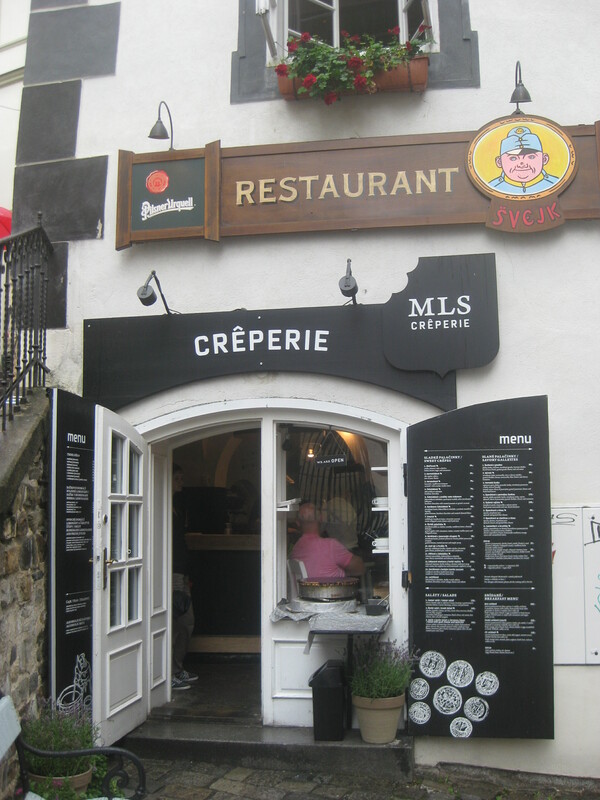 A little place called MLS Creperie has a sign to indicate vegan options on the menu. 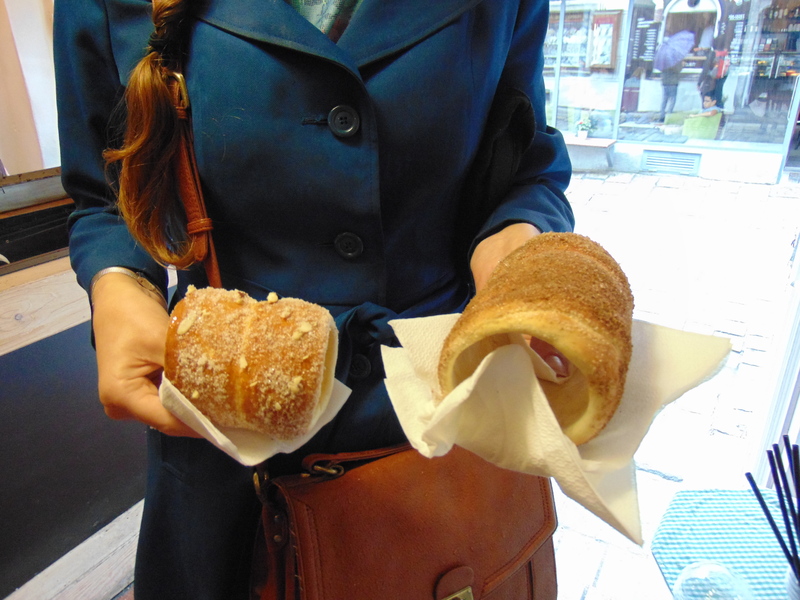 The only thing that is vegan is the trdelnik: traditional Czech chimney cake. YES! This was the first time I’d ever seen a confirmed vegan version, and I was over the moon. This place is easily found on the road up to the castle. There are quite a few MLS places dotted around the centre, but this was the only one we saw with vegan signs, so I would stick to this one for safety. And of course, don’t choose the chocolate or ice cream fillings. I got mine dusted in cinnamon, and Dr HH chose almond, though it turned out to be mostly sugar. It was such a treat! They were warm and comforting and delicious. It’s more like a sweet bread than a cake, meaning it’s not difficult to eat this much. Top tip: break bits off with your fingers, rather than trying to take a huge bite – that only leads to mess! 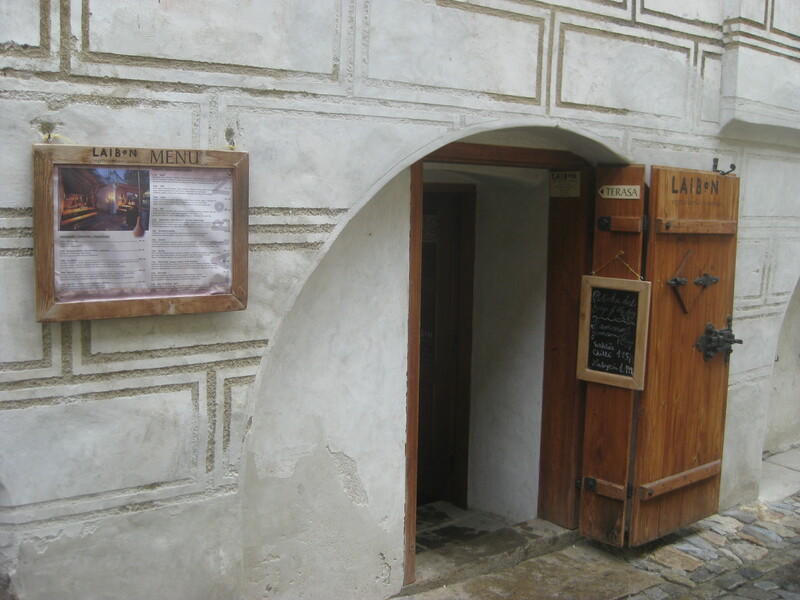 This entry was posted in Travel, Vegan Mofo and tagged Cesky Krumlov castle, Laibon Cesky Krumlov, MLS Creperie Cesky Krumlov, vegan Cesky Krumlov, vegan mofo, vegan travel, vegan trdelnik, vgnmf16. Bookmark the permalink. How very cool – I remember seeing those chimney cakes around a lot, and I would have loved to tried one. I also need to make the laibur at home – I’m going to hit up Google.cz for a recipe! OMG!!!! 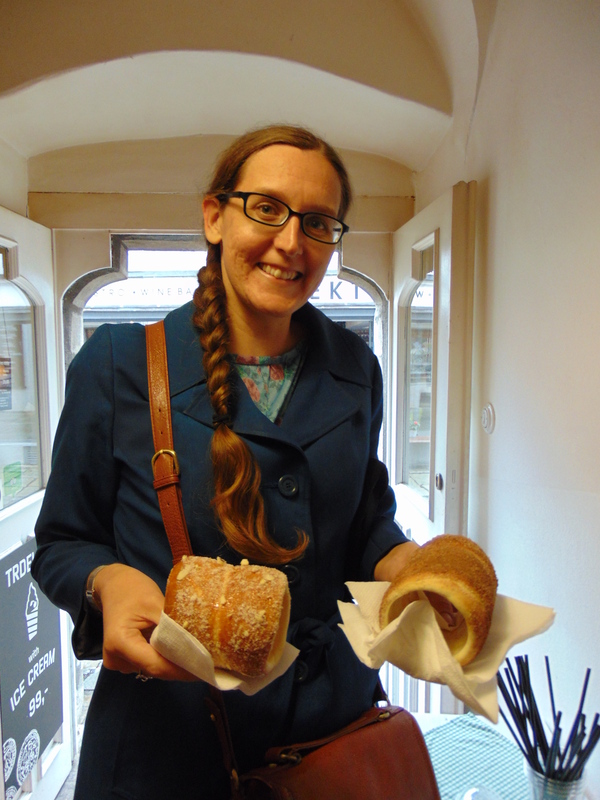 Those chimney cakes are a colossal treat! It’s such a pretty place, if you ever come to Prague I’d recommend it for a day trip, and not only for the chimney cake! Noooo! I’ve sent an update to Happy Cow – the last few reviews show that it stopped being vegan last autumn. What a shame.